Drew Angerer/Getty ImagesTerry Myerson, a Microsoft executive vice president. Microsoft CEO Satya Nadella on Thursday morning announced a sweeping executive reshuffling. The leader of Microsoft Office, Rajesh Jha, will take control of a new group that encompasses Windows and Office. Other executive moves include a new title for Scott Guthrie, Microsoft’s cloud boss, as the company increases its emphasis on artificial intelligence for business software. Terry Myerson, the executive vice president of Windows who has long been a leader at Microsoft, will leave the company “in the coming months” as part of a big reshuffling of executive leadership announced on Thursday. As part of the reorganization, Rajesh Jha, the executive VP of Microsoft Office products, will expand his responsibilities to encompass Myerson’s role. Jha will become the leader of a group called Experiences and Devices, bringing Windows and Office together under a single banner. Myerson sent his own email to employees about the change, saying that he plans to take time off before his next opportunity. “[It’s] time for me to take a break, and then look forward to my own next chapter. I’m excited to see what’s next professionally. In the meantime, I can’t wait to spend quality time with my family and pursue a few big life goals,” Myerson wrote. Scott Guthrie, Nadella’s right-hand man who’s the executive VP in charge of Microsoft’s fast-growing enterprise cloud business, will lead a new group called Cloud and AI Platform. Jason Zander, a major leader on the Microsoft Azure cloud-computing platform, will be promoted to executive VP, though he will not join Nadella’s senior leadership team, a council of top managers from across the company. Harry Shum will stay in his role as Microsoft’s research boss, but he will work more closely with Guthrie’s and Zander’s teams to help bring more artificial intelligence into the Azure platform. Panos Panay, the exec in charge of Microsoft Surface, will be the chief product officer overseeing the company’s hardware businesses. Alex Kipman, the creator of the Microsoft HoloLens holographic goggles and the Xbox Kinect sensor, is now the leader of a new group called AI Perception and Mixed Reality. In the email, Nadella frames the changes as crucial to the continued growth of Microsoft by bringing together experts in different areas to work more closely with one another. “It will take courage to keep learning and growing together – encouraging one another’s individual strengths, building more diversity and inclusion across our teams, and collaborating as One Microsoft,” Nadella said. Over the past year, we have shared our vision for how the intelligent cloud and intelligent edge will shape the next phase of innovation. First, computing is more powerful and ubiquitous from the cloud to the edge. Second, AI capabilities are rapidly advancing across perception and cognition fuelled by data and knowledge of the world. Third, physical and virtual worlds are coming together to create richer experiences that understand the context surrounding people, the things they use, the places they go, and their activities and relationships. These technological changes represent a tremendous opportunity for our customers, our partners – everyone. With all this new technology and opportunity comes a responsibility to ensure technology’s benefits reach people more broadly across society. It also requires that the technologies we create are trusted by the individuals and organisations that use them. To truly get the best impact from our efforts, we will have to push ourselves to transcend Conway’s law. Having a deep sense of customers’ unmet and unarticulated needs must drive our innovation. We can’t let any organizational boundaries get in the way of innovation for our customers. This is why a growth mindset culture matters. Each one of us needs to push on what technology can do for people and for our world. It will take courage to keep learning and growing together – encouraging one another’s individual strengths, building more diversity and inclusion across our teams, and collaborating as One Microsoft. It’s amazing what we have been able to accomplish together, and yet I still believe we are in the very early days of what is possible. It is an emotional day for me as I look toward starting my next chapter outside of Microsoft in a few months. We’ve been discussing this for some time, but today it becomes real. Satya’s leadership and insight in defining a Microsoft 365 experience, built on top of an intelligent edge/intelligent cloud platform is inspiring. I believe in it, and that these changes are great for Microsoft. Change can be invigorating for us all and I’m grateful I had the opportunity to work with Satya on helping define this new structure. I will be around as we work through this transition, and then I will continue to root on Satya and this team every day. Microsoft has been my work, my team, and my purpose for 21 years. Over the years I have worked with so many of you to take on big challenges and serve our customers. I’ve learned so much. We’ve accomplished so much together. And I have had so much fun. Your passion, commitment, and sheer brilliance has kept me inspired. You have taught me new ways of looking at the world. You made me a better leader. And together, we have delivered products that positively changed the way people work and live. I am grateful for each of you. Most recently, with Windows 10 we set out to restore the trust of our consumer and business users and set Windows up to be a key part of the new Microsoft. 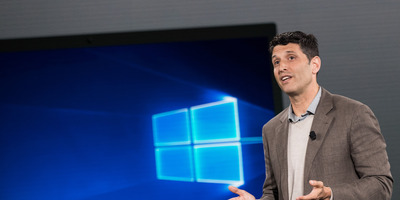 With us now approaching 700M active Windows 10 users, commercial usage growing 84% YOY, Xbox One running a Windows 10 core, Surface innovation highlighting the Microsoft 365 experience, HoloLens bringing breakthroughs in computer vision, a universal store enabling GamePass, Azure reserved instances, and Office distribution, and a revitalized partner ecosystem – we’ve made incredible progress, and set the foundation for a new chapter to begin. But it’s time for me to take a break, and then look forward to my own next chapter. I’m excited to see what’s next professionally. In the meantime, I can’t wait to spend quality time with my family and pursue a few big life goals. While today I have many emotions, I’m mostly filled with gratitude and optimism – gratitude for the experiences I have had and optimism for the future ahead. Sincerely, thank you for all the incredible experiences we’ve had together.